An essential tool for the serious fabric artist, these hooks enable you to paint any size fabric piece within your frame, and stretch silk or other fabric with ease. 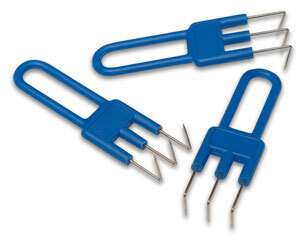 Very sharp and extra-fine, these 3-prong claw hooks won't damage delicate fabrics. They attach securely to any frame using rubber bands (rubber bands not included). Sold in sets of 24.